Portrait, Henry Lucius Mims. Image available on the Internet and included in accordance with Title 17 U.S.C. Section 107. National Alliance of Postal Employees Logo. Image available on the Internet and included in accordance with Title 17 U.S.C. Section 107. MIMS, HENRY LUCIUS (1873–1942). Henry Lucius Mims, founder of the National Alliance of Postal Employees, composer, geologist, and piano manufacturer, was born on August 13, 1873, in Bryan, Texas, to Alfred and Carrie Mims. His early years were spent attending public schools in Bryan, and he graduated from Bryan High School in 1890. After graduation, Mims taught in the Bryan public school system for two terms. During this time, he focused on history and mathematics under the tutelage of private white instructors. In April 1893 he was hired as a substitute railway postal clerk. Several months later in September, Mims was granted a provisional promotion to the Houston and Texas Central Railway; this resulted in permanent employment three months later. Mims progressed from the entry level pay grade of $800 per year to the highest level at $1,700 per year. He was one of two African Americans who managed a Class “C” line railway crew in the state. On December 30, 1896, Mims married Nannie B. Turner of Houston. To this union, two sons were born, Leonard and Alfred. Mims was an active member of the choir in the African Methodist Episcopal Church in Houston. 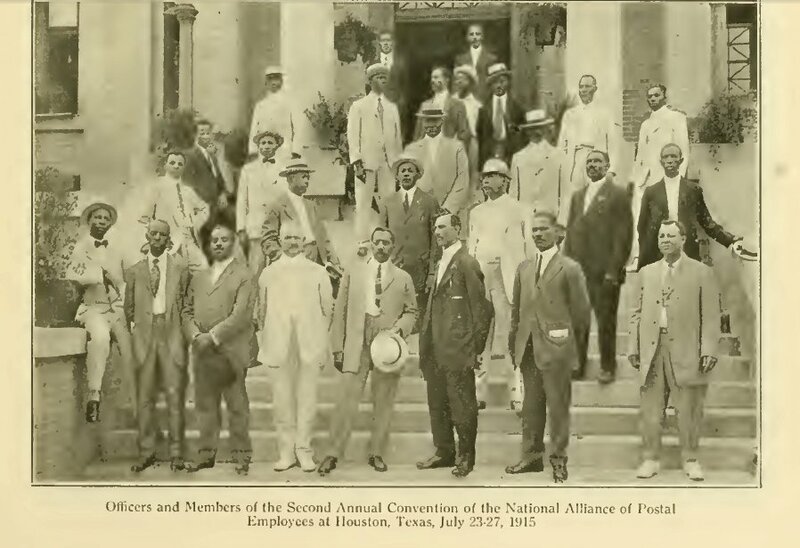 Officers and Members, including Mims and fellow railway clerks, of the Second Annual Convention of the National Alliance of Postal Employees at a Meeting in Houston, July 1915. Image available on the Internet and included in accordance with Title 17 U.S.C. Section 107. 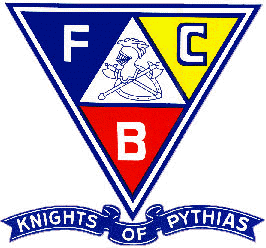 Knights of Pythias Logo. Image available on the Internet and included in accordance with Title 17 U.S.C. Section 107. 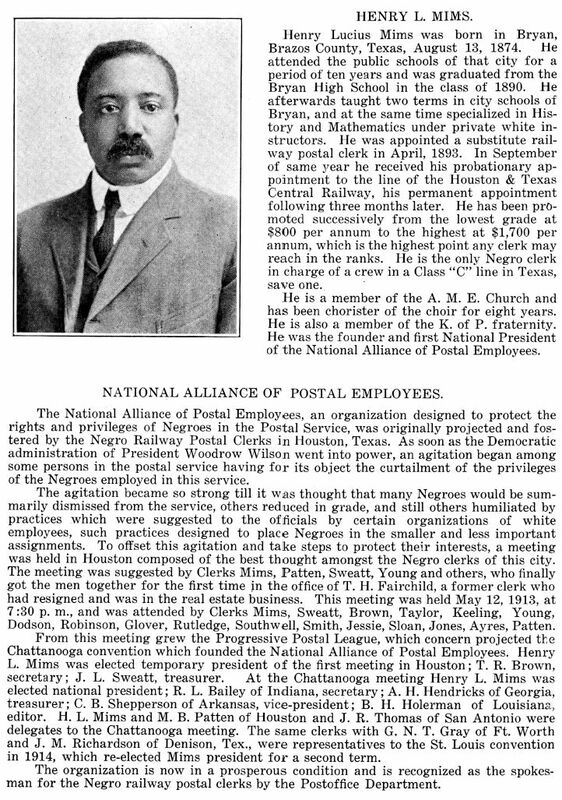 As Mims rose through the ranks in the postal service, he and other clerks became concerned about the diminishing opportunities for African-American postal clerks once President Woodrow Wilson was elected in 1912. The Democratic administration encouraged restricting the privileges of African Americans and limiting their opportunities for advancement by placing them in positions of less importance than white employees. It was in this environment that Mims attended a meeting with other disgruntled railway clerks, including J. L. Sweatt, T. R. Brown, M. B. Patten, and others to discuss African-American representation in the railway postal service. As a result of this meeting, the Progressive Postal League was formed, and it sent a delegation to the Chattanooga convention where the National Alliance of Postal Employees was founded. Not only was Mims a founder of this organization, he served as the first president in 1913 and was reelected for a second term in 1914 at the St. Louis convention. Mims was active in civic organizations, which included the Knights of Pythias. His interest in music was reflected in his ownership of Mims and Sons, a piano and church organ manufacturing company, and his composition of several songs. Mims died on March 11, 1942, in Houston of heart disease. Burial arrangements were provided by Collins-Foster Funeral Home, and he was buried in Oak Park Cemetery. Frank Lincoln Mather, Who's Who of the Colored Race, Vol. 1 (Chicago: 1915). The Red Book of Houston (Houston: Sotex, 1915). Handbook of Texas Online, Jackie Roberts, "MIMS, HENRY LUCIUS," accessed April 21, 2019, http://www.tshaonline.org/handbook/online/articles/fmiab. Uploaded on February 7, 2013. Modified on May 30, 2017. Published by the Texas State Historical Association.